When you’re a part of Magento ecosystem, looking back at a year behind you measure it, among other things, by Meet Magento events you’ve attended – as a delegate, sponsor or a speaker. Perhaps even by the ones you organized. 2016 was packed with these, and it’s only November. So, now is as good time as any to start preparing for something completely different. For the first time ever, in July 2017 there’s going to be a Meet Magento World, taking place in, well – anywhere and everywhere actually! Over the course of three days (July 11th – 13th) more than 30 speakers will give sessions in the different conference rooms on various Magento and eCommerce topics. The sessions will be held by a long list of international speakers. Who are the speakers and why them? You can check out the full agenda for this 3-day event here – the speaker list has been carefully crafted out of Meet Magento veterans and those speakers who have been the best of the best – those people who got highest scores for their speeches at various local Meet Magento events around the world. And since it’s often very rare to gather the cream of the crop in one place, Meet Magento World is a great opportunity to infuse yourself with the hottest topics presented by great speakers in a packed 3 days of events. Now, we are very proud to have one of our own make the cut – Ivona Namjesnik was invited to participate, so here’s her two cents (and some change) about this event. Ivona, hi. Congratulations for being the voice of Inchoo at Meet Magento World! How does it feel to prepare for the global stage? Aron, hi. I must admit it’s extremely flattering. Even though I believe I’m quite a “chatterbox”, I never imagined it will be part of my job description. Especially on the global level! I guess learning to channel your natural abilities sure comes in handy and makes your life a whole lot interesting. So, let’s back up a bit. 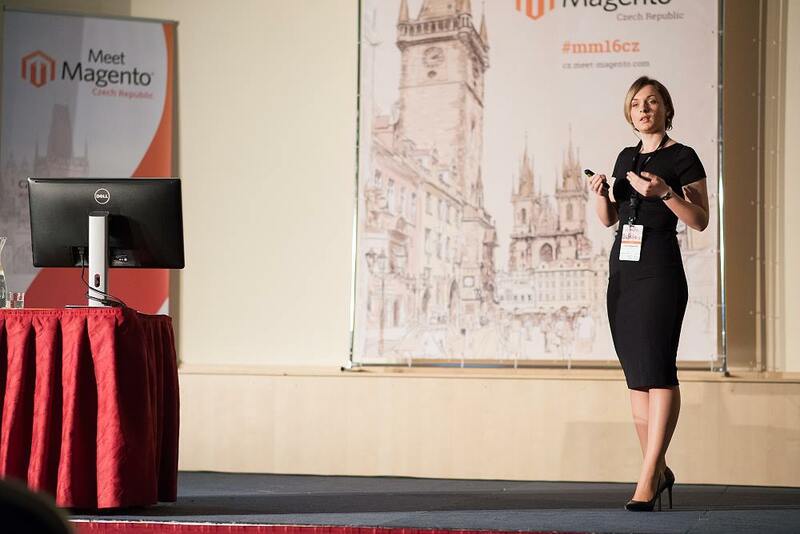 You got invited to speak at Meet Magento World mostly because of your speech at Meet Magento Czech Republic earlier this year when you got almost the perfect score – what did you talk about in Prague? Prague was quite an adventure! I absolutely loved it there and I believe overall impression after my topic “No content marketing? No future for your eCommerce business” was really good. I tried to explained (and if score is to be trusted, I succeeded) the role of content marketing and how it interferes with eCommerce in general. Basically, they are a match made in heaven and talk explained why. And what about now? How will your presentation look like this time around? I believe every brand needs a voice. And every brand has one! What brands tend to forget is a fact that being silent sends a message too. In this talk, I’ll try to reveal the mystery of finding brand voice and following it – both on social media and when approaching customers. In your interview before MMCZ in Prague you shared some thoughts about number of women (i.e. the lack of) speaking at Magento events, and tech events in general. We can all feel there is a slight shift taking place, but how do you feel this process can be sped up? And should it? That’s a tough question. As a founder of a Lean In Osijek circle, I believe we as a society should do everything that’s in our power to make sure men and women are treated equally. If speeding up the process means encouraging men and women ever the same and cheering them on, yes, I’m all up for it. For me, that’s the only normal and natural thing to do and it’s silly to think there are people who would support someone more based on their gender. What do you think about the concept of Meet Magento World? What are the pros and cons if you compare it to a “regular” Meet Magento event? I guess it depends on how one thinks of it. I love, and I believe delegates will love too, the fact that you can incorporate it into your working schedule easily. Meet Magento World doesn’t require travelling and you can be in something as comfy as PJ’s. Since this event is something really new in the Magento ecosystem, can you put on a fortune teller hat (as opposed to the storyteller one you wear on any given weekday) and tell us how do you see this event play out? Epic or fail? So epic it is. Thanks for your time, Ivona. Any final thoughts to people thinking about becoming a part of Meet Magento World? I would usually say “See you at the conference” but given the fact it’s all about digital world and connections now – see you on social media. So there you have it. The thoughts of one of the Meet Magento World speakers. Stay tuned and check out Meet Magento World official website and join the conversation #MM16WORLD and #MM17WORLD hashtags on Twitter for the latest news – and see you all at Meet Magento World! Hey Will I be able to access this online event from India from july 11th to 13th?